Niche market Fungicides are often viewed as an add-on service, so demand for them is relatively low. For many lawn care operators (LCOs), fungicide applications are an add-on service for their customers battling turf diseases. It’s important for LCOs to stay up to speed on new products, regulations and customer expectations to ensure they are using the right products as efficiently as possible. One of the newest developments in the fungicide market is the introduction of succinate dehydrogenase inhibitor (SDHI) fungicides, says Lane Tredway, technical services manager for Syngenta. Using new technologies, manufacturers have rejuvenated an old class of chemistry to develop fungicides that are more effective than their predecessors at controlling a wide range of turf diseases. Syngenta’s newest SDHI product is Velista. Other SDHIs labeled for turf include Prostar 70WG (Bayer), Kabuto (PBI/Gordon Corp.), Indemnify (Bayer), Xzemplar (BASF) and Emerald (BASF), according to Penn State Extension. While SDHI fungicides have been used in the golf course market for several years, Tredway says their adoption has been a bit slower in the lawn care market because the existing quinone outside inhibitor fungicides still perform well. But he warns that it’s inevitable that turf diseases will eventually become resistant to the products that are currently available. From a resistance management standpoint, he says it’s important for manufacturers to stay ahead of the curve in the search for new chemistries and for LCOs to understand how to use them. Rick Fletcher, technical services manager for turf and ornamentals at Nufarm Americas, says another emerging trend in the fungicide market are combination products that are adaptable to granular delivery methods. These products combine one or two plant movement strategies—such as an upward systemic and a local penetrant—to provide better control of an array of diseases. With these new products that offer broad spectrum control, Tredway says LCOs can get the same outcomes with one product that used to require several products and tank mixtures. He explains that the active ingredient in Velista can help control a range of diseases at the same time. “This will allow LCOs to get the job done more efficiently,” Tredway says. Regulations and consumer demand also impact the fungicide market. Fletcher says fungicide treatments are typically viewed as add-on services for higher-end lawn care companies, so the market for these products is relatively small. In addition, regulations and ordinances continue to limit the market’s expansion, so fungicides are not typically a chemical manufacturer’s primary focus in the lawn care market. Along these lines, Giordano says many lawn care companies are seeing their customers become more conscientious of the products used on their lawns and landscapes and demand more responsibility and accountability when it comes to environmental stewardship. Because of this trend, LCOs may consider how to communicate the benefits and features of new “ecofriendly” active ingredients. As biologicals and alternative options for disease control continue to play a role in management programs, Giordano adds that customer expectations will likely need to be adjusted because these products often don’t deliver the same efficacy that their synthetic counterparts do, particularly when it comes to spectrum and duration of control. 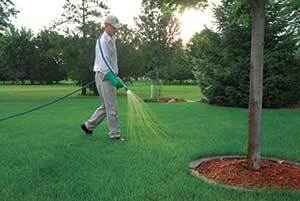 Caleb Ault, owner of UltraGreen in Little Rock, Ark., offers fungicide treatments as part of his lawn care program. When purchasing his fungicides, Ault looks for products that offer broad-spectrum control so he can treat as many different diseases as possible. In addition to traditional fungicides, Ault also uses Holganix, an organic, plant-based product that incorporates soil microbes, microbe food and nutrient enhancers to build resilient plants and healthier soils in his lawn care program. For Ault, this process is an “insurance policy” for his customers because his ultimate goal is to improve the overall health of the soil to eradicate and prevent diseases in the long term. UltraGreen is a $3.2-million company that provides 78 percent lawn care and 22 percent other services to a 98 percent residential clientele. While fungicides are a critical component to his lawn care program, Ault says the products are often misunderstood by the average lawn care customer. Selling fungicide services can be difficult because of the need to apply the product every three to four weeks, depending on the situation.